ChewBite » Blog Archive » Forget Free Range Feathers! Eat Organic! Free Range Chicken. Aaaah! Conjures up the delicious aroma of a roasted, oven browned, juicy chicken surrounded by equally browned potatoes basted and steeped in a white wine and herbed gravy waiting to be devoured by you and that you can feel good about devouring. Funny how the mind works. In that same split second we see a happy hen pecking at its 100% pure grain feed outside in the warm sun enclosed by a friendly humane wooden pen. Uh uh! Right picture, right focus, wrong USDA camera. Not the aroma or the sight but the ‘feel good about devouring part’. Senses are deceiving. And this is prime. Buy Organic! 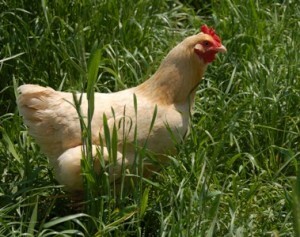 Unless your chicken is labeled organic, here’s the real picture of your regular supermarket and ‘free range’ poultry. Even though ‘free range’ conjures up that cozy picture, the only difference between the more expensive ‘free range’ and the regular market variety is that the USDA says the ranchers have to open the door for only at least 5 minutes a day in case the hens want to go outside. They may not even make it or have the energy let alone the desire, and they don’t have to. Otherwise, same chicken! There’s no other change in feed and no other difference in caged habitat. Read the egg carton and the chicken labels. Compare. You’ll see. No difference unless it’s stated. Then I’d call and possibly visit, just to make sure. Well, here’s the bonus sickening kicker: at the end of their one early forced egg laying year, just before all the lurking cancers and diseases attack their livers and bodies, they’re slaughtered and go straight to our supermarket coolers to become….us and our children! And you wonder why we and, more importantly, our children are plagued with more diseases than there are names for? Here’s one of the multitude of reasons. Forget Free Range. EAT ORGANIC! And there’s that wonderful bonus of superior taste. It will cost more, but the cost for the bills of rising anxiety, fear, medical, and health care are more than the cost of an organic chicken. I’d rather pay that. Here is one reference for my blog. I am not endorsing any ads on this site, but I thought the article was very concise, informative and summed up much already known info that would help my blog stay more concise as I tend to run on…… http://www.healthynewage.com/spirit… Also write, email, blog your favorite TV/radio news station etc. your congressperson, everyone. Only we can uncorrupt our food chain.